As usual we made the most of our bank holiday and as I'm sat here I'm absolutely knackered, I would actually like to go to bed! I worked Saturday as normal so we didn't really do much, just went to my parents for tea we were supposed to be having a BBQ but didn't end up having one because the weather was quite dull. On Sunday we got up early with the kids and headed out to the car boot sale. Its the first one we've been to this year, we whizzed round it and went to another. The kids loved it and picked up some Ben10 toys. I don't particularly like Ben10 (no offence Ben!) and would never buy the toys but I don't mind paying 50p here and there. I picked up a few things that I will sell on ebay to put towards holiday funds. Just as we got home my parents pulled up and asked if we wanted to go to a farm in Alderley Edge but when we got there it was closed so we decided to go out to a local pub with a park for lunch. Whilst we were there they decided they would have a BBQ for tea! We visit the pub quite often for lunch or tea and its really nice, this is the first time this year we got to sat outside though. Here's some pictures in the park. 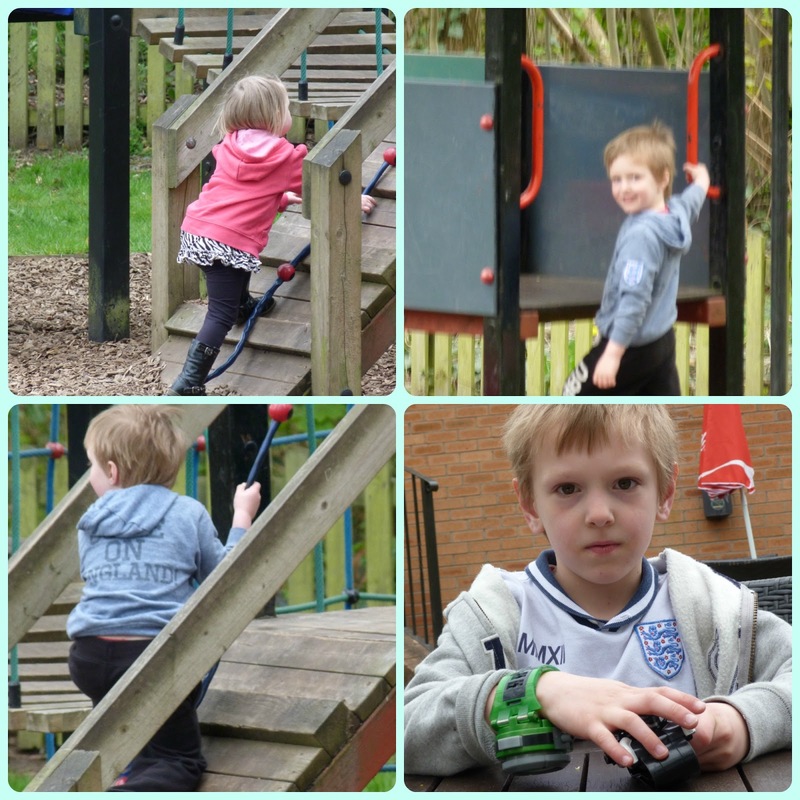 It was really nice yesterday it was also the first time the kids could happy play outside have have all the doors open so they can come in and out as they want. Dave was gardening and I was doing some work. We later headed to Mum's for a BBQ. I had a gorgeous steak on a bap! Mum made ginger cupcakes with chocolate chip, with a ginger frosting topped with crunchie, they were the nicest cupcakes I have ever had! (Damn I should have taken a picture). Today we treated ourselves to a nice breakfast (not very fitting with yesterdays blog post). But they were a nice treat. We have spent most of the day in the garden today. 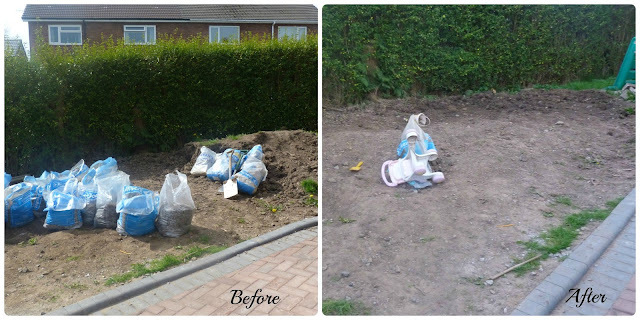 When we did our drive last year we put all the mud we dug out onto our garden and have been slowly taking it round to the brother-in-laws who wants it for his garden.Today we got really stuck in and was determined to get it all moved so we can start making it look nice again. So here's before and after pictures. They aren't great but the huge pile of mud has gone! During all the gardening we got a phone call. 'Mum and Dad are having a BBQ do we want to go'. Hell yes! We really need to make the most of this nice weather while we can! I had pork chops and a cornetto for afters (so disappointing they are teeny now, I'm sure they are actually smaller than last year). Should have took a picture! I'm rubbish! At some point today, after dinner I think, (its been a blur), we went to B&M and picked up a cute little gazebo. I can't wait to get it up they will love it. And a hose pipe as since we laid the turf last week it has only rained once. I'm going to have a shower now and get my summer PJ's on and get a good nights sleep ready for tomorrow. I wish we could have a 3 day weekend every week end!